Hi, guys! We hope all of you are finding your way over here to our new URL just fine. Long story short, Kara woke up friday morning to find our website had been taken from us! It was a stressful couple of hours on friday morning trying to get everything back up and running and to also take the precautions so this never would happen again. A big smooch and thanks for all of you who emailed and texted asking: what happened to your website?! And a big apology for those of you who bought ingredients for a recipe and then logged on to find the recipe to actually make the food and weren't able to. :( Such a bummer and Kara and I felt so bad when we heard that. You guys are all so supportive and wonderful and we never want to let you down. Also, I noticed today that when you try and search for a recipe that it isn't working. I'm on it! We hope you are having a good week so far and please pass the word along about the change in our web address. THANK YOU! Okay, let's talk lemonade! 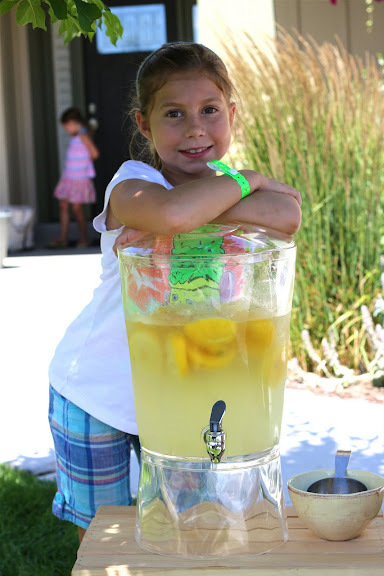 Being a kid is so much fun, especially in the summer months and setting up and running a lemonade stand is one of those rights of passage. Every kid should experience running a lemonade stand. Don't you think? My friend Alison and her three girls did a lemonade stand earlier this summer, so they were all prepared. Alison bought these crates at Michael's and they had a darling homemade poster that read: Fresh Lemonade. All I did was run to the store for lemons and some candy and we were set! Gum balls, pixie sticks and swedish fish. In a small pot, dissolve sugar into 2 1/2 cups water over medium-low heat. Allow to heat and thicken slightly. This will take about 5-7 minutes. Remove from heat and set aside to cool. Rinse lemons, cut in half and squeeze lemon juice into intended serving vessel (the one in the pictures is from Costco and I love it! It's light and easy to clean). Don't discard squeezed lemon halves. Add them in with the lemon juice. Add gallon of water, simple syrup and bag of ice. Stir thoroughly with a long spoon. Serve. 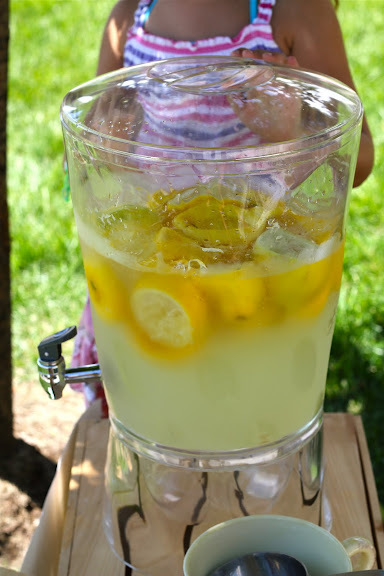 The pulp from the lemons jammed the spout and made the flow of lemonade really slow, so we ended up ladling the lemonade into the cups. Next time, I may strain the lemon juice or I may not. It didn't bother the girls at all to serve it this way! The girls used a measuring cup as a ladle for better control and had a bowl to rest the measuring cup in between servings. Stir the lemonade periodically throughout service. The lemonade at the bottom of the vessel was sweeter and more flavorful as opposed to the lemonade at the top, surrounded by all the floating ice. You can also squeeze in some pure lemon juice from concentrate (taste as you go until you reach desired flavor) if you aren't up for squeezing this many lemons. Remember this lemon squeezer? It is handy dandy. Cat and Lily rehydrating between customers. Being lemonade girls is hard work. Homemade poster. The perfect touch! From top to bottom: Cat, Drew, Ellie, and Lily. We set up a picnic blanket behind the stand so the girls could relax in the shade. This picture says it all...I hope we can do another stand soon!! And thanks to all our Midway friends who stopped by and bought lemonade! I absolutely, positively LOVE our neighborhood! So awesome! It makes me want to live in Midway too!! Oh my goodness how could you not want to buy lemonade from those cuties! That lemonade sounds delish! I would have bought the heck out of their lemonade - how cute! P.S. I have that same container, and I'm so sick of getting raspberries/lemon seeds/etc stuck in the spigot. I think I'm going to try putting a strainer on it - maybe a little piece of pantyhose rubber-banded around the opening? I'll let you know how it goes. P.S. I bet you never thought I'd use the word "pantyhose" on your blog.